Hi Pavel, I know it’s 2 years ago but I have a question. I’m trying to get this to work in SQL2012/VS2012 but whatever i try to do, the input.InputColumnCollection does not contain any incoming columns. Online documentation supports your code so I guess I’m doing something wrong. Any hint? Never mind. I found my mistake. Sorry to bother you. good to know you have solved your issue. btw. what was the mistake? Did you manage to get this working with SQL2012/VS2012? 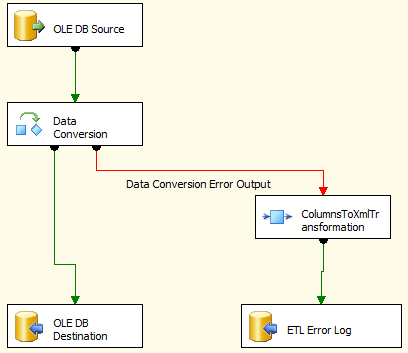 I get the following errors linking in the SQL2012 DLLs, I’m assuming this component can’t be run in 64 bit? Value of ‘null’ is not valid for ‘stream’. It works without issues with SQL Server 2012 and 2014 with small modifications. 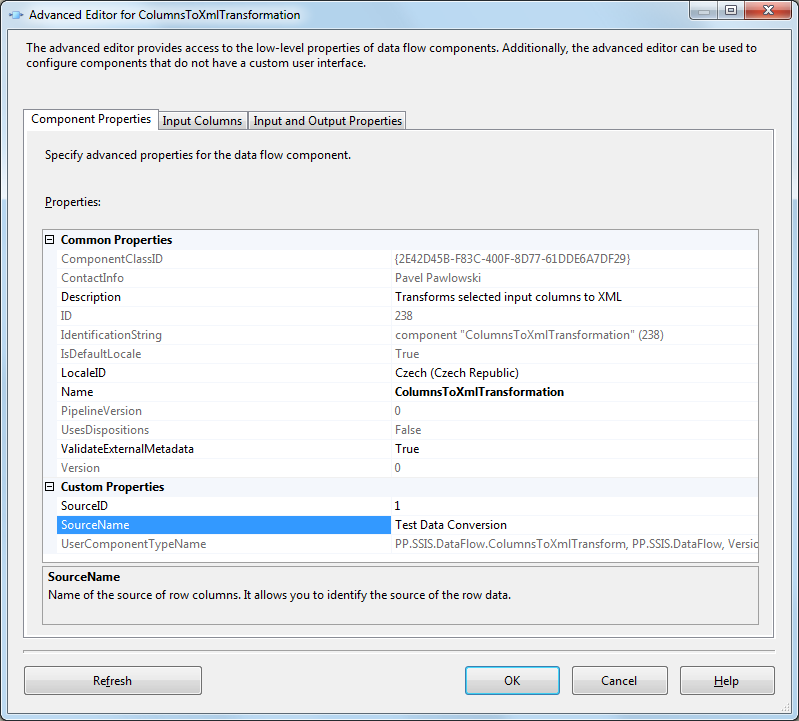 When I will have a little more time, I will post solutions for both SQL 2012 and SQL 2014. Probably during weekend or start of next week. Anyway, you are buliding the solution, you have to build it against Any CPU. As the VS is x86 SSIS can run in both x86 and x64. I have been able to get it working under VS 2012. It seems there is a problem with VS2013. The component installs correctly and works fine under VS 2012, however fails to display in the toolbox under VS2013. Could anyone provide the sample project for this as the URL in the post is no longert valid!? 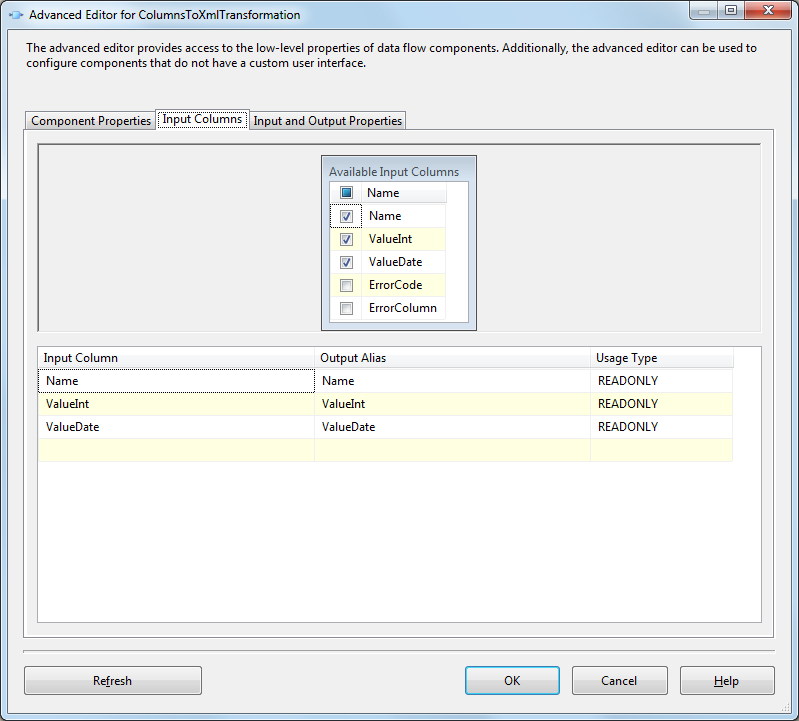 For what version of SSIS you are interested? 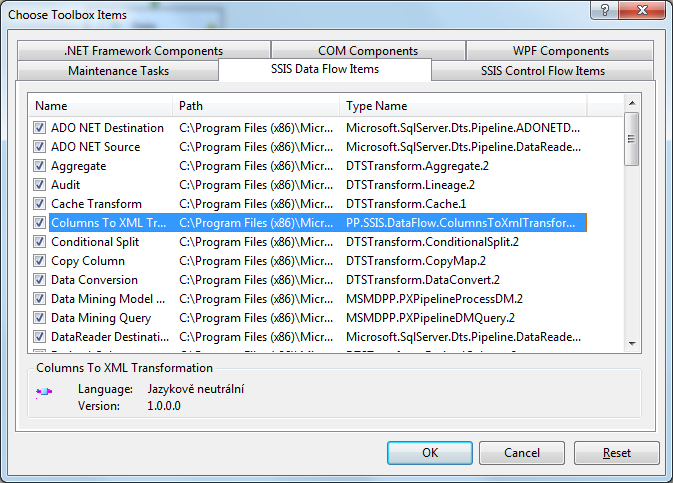 Hre yo ucan find my complete solution for DataFlow components including ColumnsToXml, HashColumns etc. Those are quite enhanced by GUI etc. It contains versions for 2008, 2012 and 2014. Project contains laso some other components including GUI for parameterization. A great many thanks Pavel for making public on GitLab. Best component around for converting error rows to XML. Thanks for the great tools. I am using them in a couple of projects. I am attempting to upgrade my project to VS2015 and SSDT 2015, but am having problems getting the components to work with the TargetServerVersion in SSDT 2015. The problem I am having is the component only shows up in the tooldbox when the TargetServerVersion is set to 2016. Changes I have made to project / deployment on my system. I also understand I need Upgrade Mapping and Extension files for the components. Do you have the Upgrade Mapping files mentioned in the blog above? I have created what I believe are the correct files, but I am still having the issue with the component only showing up then the TargetServerVersion is set to 2016. Hi, I’ve just committed newer version of the Components to GitLab. The problem that components were showing only for the latest version of SQL Server (based on TargetServerVersion) was caused by settings on the reference SQL Server assemblies and this should be fixed in the projects I’ve pushed. The latest version contains bunch of enhancements especially to hash component, but also to other version. In the latest version the assemblies are named by including the target SQL Server version, but even previously it was not necessary, because strong names were different (different signing keys) and all versions could exists side by side. Related to automatic upgrade of components. I have the Extension files and Upgrade Mappings available, but still having some issues with the automatic upgrades, so those are not included yet on GitLab. Once I will have some spare time, I will investigate the issues with the Upgrade Mappings and once issues are resolved, I will put them also into the repository. Anyway, The pushed version works properly with multiple all TargetServerVersions. Lastest version published on GitHub https://github.com/PavelPawlowski/PP.SSIS. Existing GitLab repository was removed.